Conservatives in Canada could learn a tough lesson over the next 2 years. If the past month taught them anything, and there is no evidence to say it has, it should be as follows: do not blow the dust off the same old political playbook you have been recycling for half a dozen elections. There is something demonstrably different about this political cycle. His name is Justin Trudeau. And no, he is not a proven leader whatsoever. He is not the Canadian Barack Obama. Trudeau is a privileged trust fund kid who is just beginning to shed his precocious image, and at age 41 being precocious is not a favorable quality. He over annunciates his words, he sometimes refers to himself in the third person and his off the top banter is often ill advised. All that being said, his arrival happens to coincide with some of the most interesting political caveats the country has ever seen. First and foremost, young people are becoming engaged. This has always been something conservatives feared, but the old adage is true; young people, for the most part, lean left. Always have, always will. The 2010 Calgary Mayoral election was the start of a brand new idea in electoral campaigns. Grass roots strategies reinforced a savvy, online presence that was not just directed towards younger voters, but executed by young people as well. Naheed Nenshi’s campaign ought to be in political science textbooks across the country. Trudeau knows this and has added something Nenshi did not have; name recognition and celebrity status. Secondly, the recent presidential elections south of the border has made Canadians universally repulsed by dirty politics. We don’t just dislike ominous music, grainy footage and quotes taken out of context, we find it to be fundamentally un-Canadian and lacking even moderate ethics. So when the conservatives released their first attack ad against Trudeau most people were expecting something to snooker the newly elected leader, something he couldn’t run from. Namely, himself. But instead of a savvy attack ad spotlighting Trudeau’s inexperience or rookie status, the conservatives opted for a misleading collage of half truths, cheap shots and blatant dishonesty. They did adjust their playbook from the days when they hammered Stephane Dion and Michael Ignatieff, only they went in the wrong direction. If the conservatives were playing baseball, this strategy of mocking the young Liberal leader would be akin to trying to execute the hidden ball trick. Sure, they may fool their opponents and the fans once in a while, but if everyone is expecting the same trick all the time, how successful will it be in the long run? Meanwhile, Thomas Mulcair and the NDP are coming apart at the seams. Unlike the conservatives who are mildly concerned about the impact of Trudeau’s leadership, the NDP are frustrated at the prospect of their popularity lasting just one election cycle. When Trudeau made his first appearance at Question Period, Mulcair tried to overshadow the youngster by frantically screaming his inquiries about the temporary foreign workers issue, and by doing so he slid nicely into the exact generalizations his enemies have branded him with since he became leader; he’s angry, unstable and arrogant. You can now add ‘spooked’ to that list. Not to be outdone, Harper managed to squander a golden opportunity to expose Trudeau’s lack of experience in the aftermath of the recent bombings in Boston. Trudeau sloppily pontificated about the motives and mindset of the bomber(s) saying “But there is no question that this happened because there is someone who feels completely excluded.” This was a gaffe. Not only was it too soon to ponder the broader question of societal exclusion, or even mental illness, after all there was no suspect at the time of his interview. But it also showed Trudeau’s lack of statesmanship. 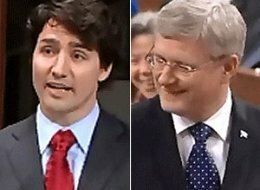 But rather than take the high road and offer unsolicited advice to his young counterpart, a move that would have made Harper seem less wooden then he normally does (the backdrop of Margaret Thatcher’s funeral would have been a bonus too), he politicized the act of terror by accusing Trudeau of rationalizing the killings. In case you need a refresher on American politics, Harper’s statement was one knee-jerk away from saying Trudeau had emboldened the terrorists. It was a missed opportunity, for sure, but it was so much more than that. It punctuates a long term problem for a government who overtly disrespects everything about their rivals and reveals the mind of a Prime Minister who may be past his prime. He seems, for all intents and purposes, out of ideas. It also doesn’t help to have your parliamentary mouthpiece oversimplify global terrorism. Pierre Poilievre, a normally articulate conservative MP, wanted to punctuate the idea that terrorists should not be coddled. The problem? Nobody said they should. Additionally, every intelligence agency on the planet believes in finding the root causes of terrorism. This technique is Tea Party politics in its purest form. What Poilievre was really doing, especially when he doubled down on that statement in the House the next day, was deliberately watering down the electorate by simplifying terrorism into a good VS evil context. In short, the conservatives do not trust Canadians with details. Trudeau, while silly for being so quick to opine about root causes, Forrest Gumped the conservatives through his gaffe and accidentally forced them to reply through several gaffes of their own. A simple way to take the wind out of Trudeau’s sail immediately is for the Harper government to go positive. If Trudeau predicts more attack ads, hit the airwaves with your government’s success stories instead. If Trudeau stumbles during question period, don’t smirk with glee but ignore it and answer the question. The more Trudeau looks like he has a secret copy of the conservative playbook, the more attractive his leadership becomes. One guarantee over the next two years will be Trudeau’s broken promise of not going negative. He genuinely believes he can win without attacking Harper, a monumental error in judgment. He has the opportunity to attack differently from his rivals who are stuck in a time warp where overly simplistic, inaccurate ads hit hard and resonate. They don’t. Not anymore. The only people responding to the school yard ads where facts don’t matter are the base of the conservative party and over the hill consultants who haven’t been relevant since Bob Rae was premiere of Ontario. And for all intents and purposes, this base has exactly zero influence on the rest of Canada. The conservative movement has relied on a peculiar strategy regarding their most loyal supporters; misinformation and ignorance. The last Alberta election spotlighted this disconnect when the far-right Wild Rose Party were trounced by the Progressive Conservatives. Even in Alberta, the bastion of conservativeness in Canada, people were gun shy to throw their votes behind climate change denying, uncomfortably religious people who more closely resembled the worst of the Tea Party movement rather than the best of Canadiana. This country simply does not have the market necessary to move in a direction where science doesn’t matter, where sloganeering replaces substance and where condescension trumps respect for voters. This is Canada. We believe in man made global warming. We believe in evidence based policies. We believe marketing ploys should only be used when selling products we don’t need. But we do need leadership. And if you are Justin Trudeau, stop pretending you are still getting to know Canadians. We got it. We get you. Now tell us your ideas or lose us forever. And for heaven’s sake, put the boxing gloves back on and let’s see a fight.